Group formation has been found by research to go through four stages of development. These stages are forming, storming, norming and the performing stage. (Tuckman, 1965) I am going to discuss how these stages related to my job as a bartender and what took place in all of the stages. The forming stage is when the members are introduced and information gathering occurs. (PSU World Campus, 2013) With my job as a bartender, this usually happened in training. The person that was training the new hire would ask that person questions so they could get to know them and make them feel comfortable. The trainer also asked questions to determine their skills and knowledge. It was important as the trainer to assess areas where they were either lacking or very proficient. Some people had no experience. Other may have worked at a martini bar and was great at that but very unknowledgeable about wines. The storming stage is “characterized by group conflict” and includes group members determining how a task will be executed. (PSU World Campus, 2013) I can relate this to my bartending experience because when you are really busy you have to make a decision about the best plan of action. The conflict in my scenario would be getting overwhelmed. When this occurred you would have to decide who was best and fastest at doing certain things. Some people dealt with customers better and others excelled at knocking out making drinks quickly. 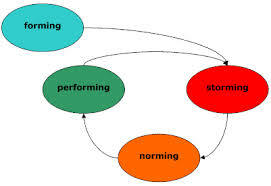 Norming is when there is an “emergence of a leader and development of group norms” appear. (PSU World Campus, 2013) I think it is completely normal for a leader to appear in any group. In my experience with bartending this leader is usually someone who has seniority or the individual or individuals that perform the job the best. Usually people with seniority have been doing the job for a very long time and are very capable of giving people instructions and direction on what to do. People that are exceptional good get to almost bypass seniority status because they have the skills to back it up and influence people to the point where others listen to them and do what they say. People begin to work together better as a team after this stage because the leaders are apparent and everyone knows their place in the group. Lastly is the performing stage. This stage is characterized by the group being functional and the goal is performance of group tasks. (PSU World Campus, 2013) In bartending, and with my experience, this takes place when all the people working together are aware of their own strengths and weaknesses as well as the other peoples. This is where there is sort of a flow. Everyone knows their place and everyone works as a machine to get the common goal reached. That common goal is having high sells and making good tips. Everyone plays up their strengths and covers other people’s weaknesses. I think anyone who has ever worked on a team or participated in a group can correlate it to Tuckman’s four stages of group development. There will usually be forming, storming, norming and a performance stage. The image depicts how you don’t necessarily always go from stage two, to three, then four. (Bales, 1965)After forming it is possible to revisit stages in different orders. Groups can change when a member leaves or enters and the stages can then be revisited. Bales, R. F. (1965) ‘The equilibrium problem in small groups’ in A. P. Hare, E. F.
I think there are probably tons of people in the professional field that have honed leadership skills and many other skills as a bartender. I think the skills that you learn as a bartender could be helpful and insightful. They could also be supportive to any other job, in my opinion. This is because what you have to learn and deal with is so multifaceted. You have to learn lots of recipes and how to execute them correctly. You get experience and insight in marketing strategies for the business as well as personally. You have to either have or be able to learn great communication and interpersonal skills. This is so you can work well with the different types of people you work with. You also have to have these skills in order to be able to work well with all the different types of customers you encounter. This is made even more difficult than interactions with people at a regular job because most of the time you are dealing with intoxicated people. You also have to develop great time management skills that could pertain to any future job in any area. I know from experience that over 90% of general managers or managers in bars had at one time in their life been a bartender and that helped them to get to that position. I also know a lot of people who were bartenders and then parlayed that into a successful real estate agent or broker career. I think bartenders make great sales associates as well. They are very personable and usually more than average in the looks department. I described my experience as a bartender as being a part of a group and correlated in the Tuckman’s four stages of group development. Although the term groups and teams can be interchange at times, there can also be some small differences to take into consideration. You asked whether my job experience as a bartender would have been considered a team instead of a group. I chose to describe it as a group instead of a team because a “group has a single mission or goal” and “each member of the group is responsible for a separate piece of the task” which is “then combined into the final product.” (PSU World Campus, 2013, L.9) I felt this described the interactions of my experience as a bartender because the goal or mission, like you said, is to make the business money and make great tips. Each bartender, even though many times you work alone, is responsible for what I consider to be a separate task. In some instances you don’t interact with the other bartender or bartenders at all. You stick to your section. Of course you are walking around behind the same bar but you are focused on your separate orders and checks for your own personal register and money bank. You share the goal of making money for both the business and yourselves but you could potentially not ever speak to the other workers. Some people do work with others where they have a system where they ask each other for assistance or they communicate a lot but that is not necessary to do the job and do it well. I chose to describe it as a group over team because team was described as having “a single mission or goal, but the team members cannot function without interacting with each other while working on the task.” (PSU World Campus, 2013, L.9) You still have a single mission or goal of making money but in no way does there have to be interaction with other bartenders in order to complete the goal. I have worked in nightclubs where the music is so loud that you don’t ever talk to the other bartenders through the whole shift because you would have to scream and yell. In scenarios like that you especially do your jobs separately. You practically won’t talk at all to anyone. You will get good at reading customers lips and your talking to anyone is very limited. Your bodies move around each other behind the bar and you interact in that way, but it is not necessary to speak or rely on one another in order to do a good job or meet the goal. It seems as though bartending is an experience that can teach leadership skills. Do you think that there are many professionals in other fields that may have honed some of their leadership skills as a bartender? I loved your concept of applying the four stages of development a group goes through to your current job. While I agree with your concept of applying these stages to your job as a bartender, I also can’t help but ask if you don’t think in some way you may be part of a team instead. According to Utley, Brown and Benfield (2009), a team is interdependent with a single mission or goal and the team cannot function without interacting while working on this common goal. Wouldn’t your goal as a team be that of making the business you are working for the most profit? According to Northouse (2013) you each have an applied function within the organization. If your goal was not making the business money, I would think it may be geared toward making tips at the very least. Either way, you would all still have a common goal and maybe not be able to reach the desired outcome if you were not at least somewhat working as a team? Northouse, P. G. (2013). Leadership: Theory and Practice (Sixth Ed.). Los Angeles, CA: Sage Publications, Inc.
Utley, D. R., Brown, S. E., & Benfield, M. P. J. (2009). Working group or team: Characteristic differences. IIE Annual Conference Proceedings, 415-420. I loved your concept of applying the four stages of development a group goes through to your current job. While I agree with your concept of applying these stages to your job as a bartender, I also can’t help but ask if you don’t think in some way you may be part of a team instead. According to Utley, Brown and Benfield (2009), a team is interdependent with a single mission or goal and the team cannot function without interacting while working on this common goal. Wouldn’t your goal as a team be that of making the business you are working for the most profit? According to Northouse (2013)you each have an applied function within the organization. If your goal was not making the business money, I would think it may be geared toward making tips at the very least. Either way, you would all still have a common goal and maybe not be able to reach the desired outcome if you were not at least somewhat working as a team?